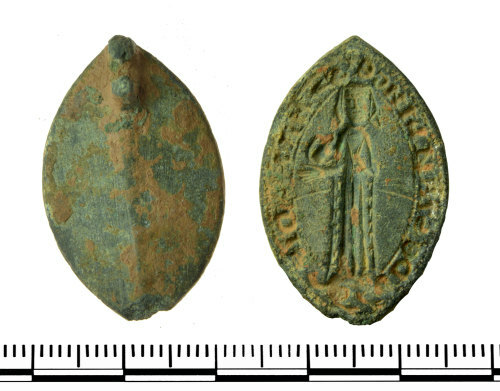 Copper alloy pointed oval vessica shaped seal matrix that has a truncated loop on the top of the reverse. The face is finely decorated with a female figure standing in a long dress that reaches to the floor, there is a gathering of cloth in the front of her body that would be the seam of her garments, then a further gating of cloth either side which is adorned with small stamped chevrons in order to give the impression of a fur lined clothing. Her head is finely detailed with pellet eyes, a defined nose and slot mouth; surrounding her head are angled straight lines the depict a head covering such as a wimple. 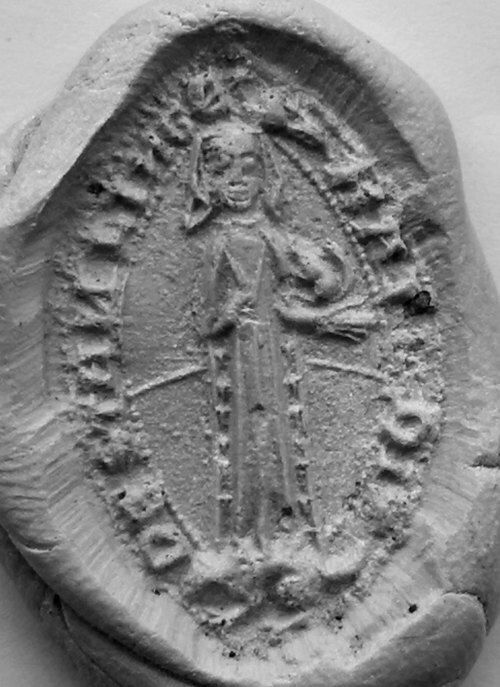 Her left hand he held at her chest, possibly with one or two fingers raised (the detail is obscured by encrusted mud). While the left hand is held out to the side of her body holding up a squirrel that has a large curled bushy tail. She is shown standing on an animal, possible a dog or ermine. Behind the figure and at waist height is a slightly arched line.